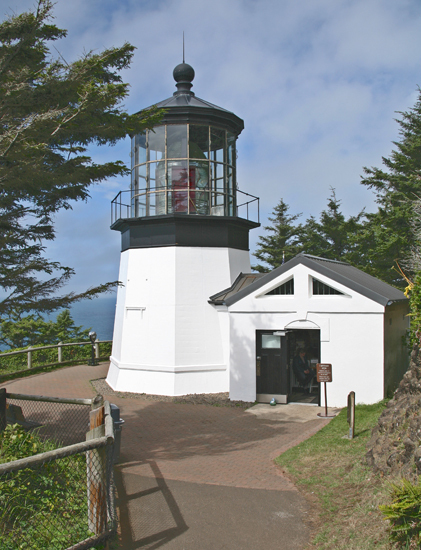 Located in “the land of cheese, trees, and ocean breeze,” Cape Meares Lighthouse sits on the Oregon Coast at the northern end of the beautiful, twenty-mile-long Three Capes Scenic Loop. Cape Meares was originally named Cape Lookout by explorer Captain John Meares in 1788, but nautical charts produced in 1850 and 1853 mistakenly put the name on another cape, ten miles to the south. By the time the mistake was realized, Cape Lookout was being widely used by mariners for the southern cape. George Davidson, an officer with the Coast Survey, decided it would be easier to rename the original Cape Lookout than correct the maps, and in 1857 he renamed it Cape Meares. 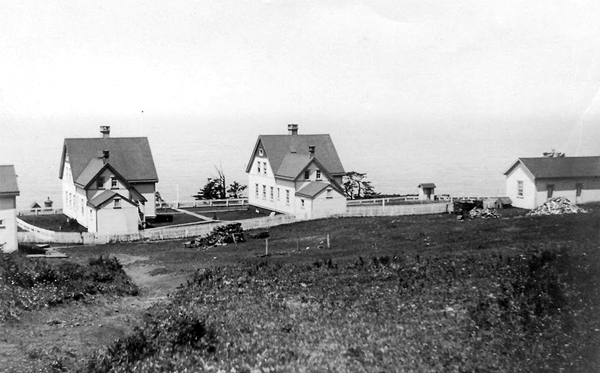 In January 1886, Congress approved $60,000 for construction of Cape Meares Lighthouse, and bids for building the light station were opened on August 30, 1888. 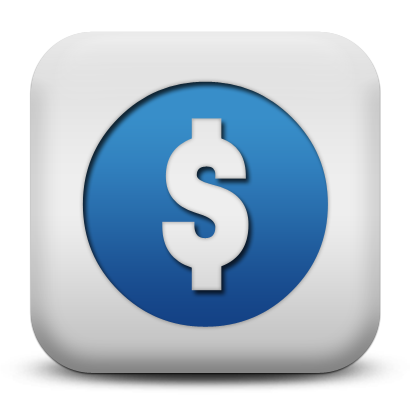 Three separate contracts were awarded for the work: Richard Leaman of Portland was awarded a $26,000 for erecting two frame keeper’s dwellings, two brick oil houses, a barn, and cistern, and for draining and grading the grounds. Willamette Iron Work of Portland was given a $7,800 contact for supply the metalwork for the tower, and Charles B. Duhrkoop of Seattle received a $2,900 contract for erecting the tower. The dwellings and various outbuildings were finished on November 28, 1889, and the tower, with lens in place, was completed on December 23, 1889. 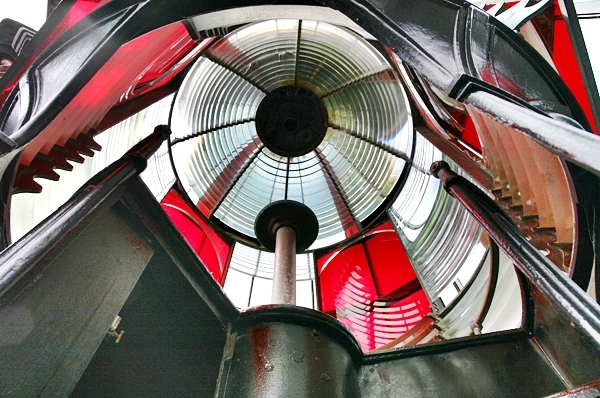 The first-order, Fresnel lens, made in France by the Henry-Lepaute firm, was shipped around Cape Horn to Cape Meares, where a hand-operated crane made from local spruce trees was used to lift the crates containing the prisms of the one-ton lens up the 200 foot cliff to the tower. Made of sheet iron lined with bricks, the octagonal tower is the only one of its kind on the Oregon Coast and sits on a ledge cut from solid rock. 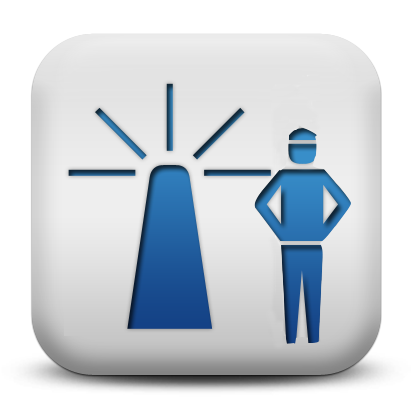 Anthony W. Miller, the station’s first head keeper, exhibited the light for the first time on January 1, 1890, the date that had been fixed and publicized by the Lighthouse Board. 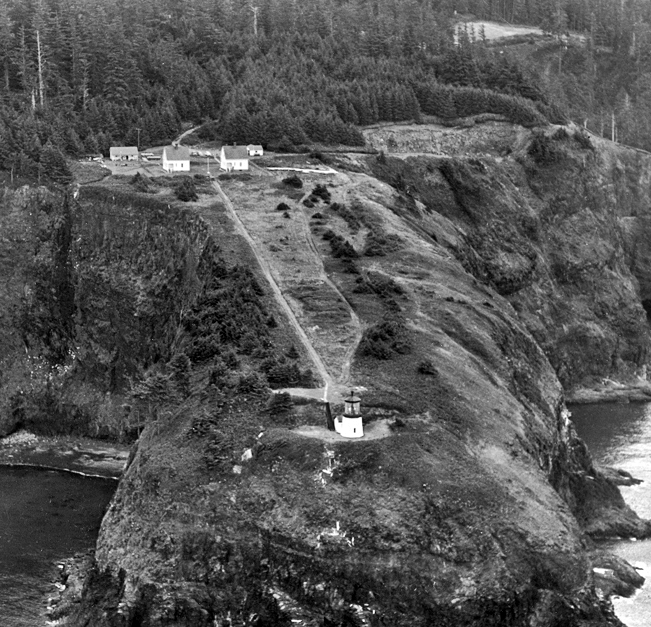 Though the squatty lighthouse was only thirty-eight feet tall, the shortest in Oregon, thanks to the lofty cliff, the light had a focal plane of 223 feet and could be seen for twenty-one miles. The characteristic of the light was fixed white, punctuated by a red flash each minute. This was achieved by the giant lens completing a revolution once every four minutes. The white light had a candlepower of 18,500, while the focused red light had a candlepower of 160,000. Roughly every two hours, the keeper had to wind up a 200-pound weight that would power a clockwork mechanism responsible for turning the lens. The lens rested on brass chariot wheels and was equipped with four bull’s-eye panels covered with ruby glass. A brick workroom abutting the tower was added in 1895. The station’s two, seven-room, one-and-a-half-story dwellings were located 1,000 feet up the hill from the tower, where the parking lot is today. Head Keeper Anthony Miller lived in one dwelling, while Andrew Hald and Henry York, his two assistants, shared the other. Water from a spring was piped to the station and stored in brick cisterns. About once a month, a supply run would be made to Tillamook. The quickest way to the city was a six-mile pull by rowboat across Tillamook Bay, starting at a sandspit two miles north of the station. The trip had to be timed to coincide with high tide, as during low tide, the bay became a muddy mess. In 1893, $5,000, which was part of $9,000 left over from the construction funds, was spent to build a wagon road to link the station with the county road near Netarts. 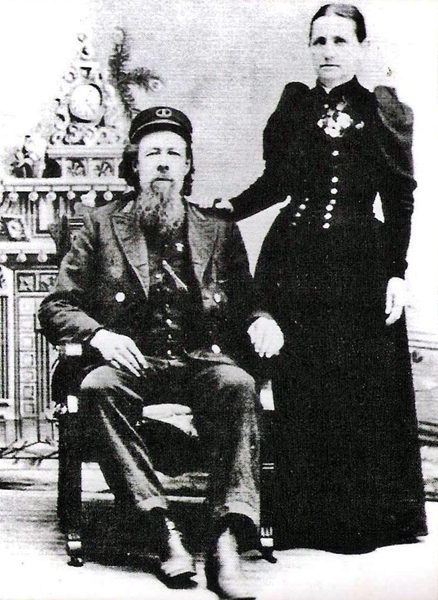 A few days later, Harry D. Mahler, the new head keeper, arrived with his wife and three children from Patos Island Lighthouse. 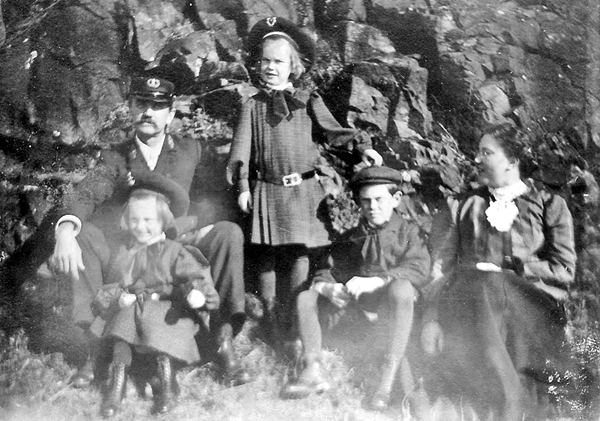 Mahler had served as the first head keeper at Patos Island for a decade, and after four years at Cape Meares, he would continue his service back in Washington at West Point Lighthouse and Alki Point Lighthouse. 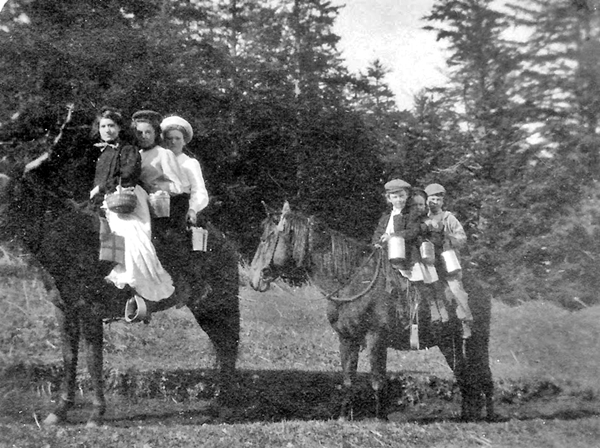 With lunch pails in hand, the three Mahler children, Howard, Frances, and Margaret, would pile atop a horse and ride to a one-room schoolhouse located about a mile from the station. They were usually accompanied by Miss Endicott, their teacher, and the daughters of Assistant Keeper Samuel Morris on a second horse. 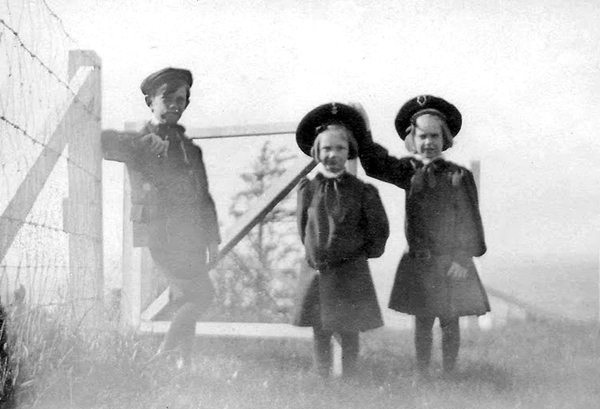 One day, young Margaret Mahler slipped and fell off a log just as her brother was swinging an axe. The blade struck Margaret in the forehead, forcing members of the family to set off on an all-night, horse and buggy ride to reach a doctor. 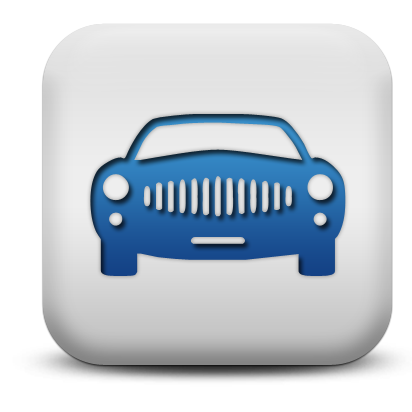 Today, the drive to Tillamook takes just sixteen minutes. In the early 1900s, the resort community of Bayocean was built on the southern spit of Tillamook Bay, where visitors enjoyed a splendid view of the both the ocean and bay. Uncommon for a town of its size, Bayocean boasted a hotel, 1,000-seat movie theater, a bowling alley, dance hall, and a heated natatorium with a wave generator. 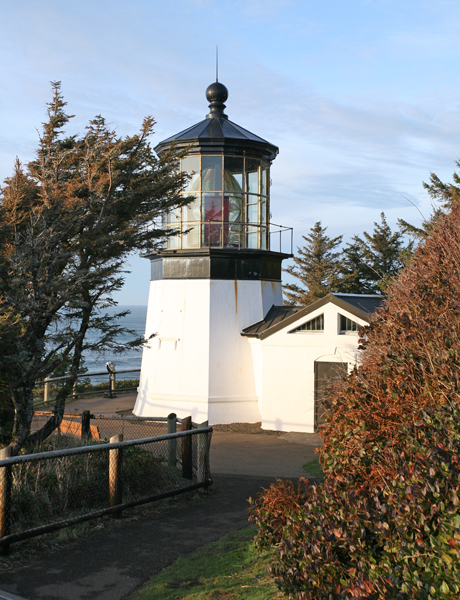 One of the favorite excursions from Bayocean was a hike to Cape Meares Lighthouse. Bears were occasionally spotted on the trail, and the keepers at the lighthouse had reportedly killed several and used their skins to adorn their premises. It wasn’t uncommon for over fifty visitors to register at the lighthouse on a summer day, and once there, they would often throw morsels down to the sea lions that congregated at the base of the cliff. Most visitors came to Bayocean as part of a three-day trip from Portland aboard the S.S. Bayocean. Entering the turbulent waters at the unprotected mouth of Tillamook Bay could be a frightening experience for passengers aboard the steamship, and in the 1910s, a jetty was built to reduce the waves at the entrance to the bay. While the jetty improved travel to and from Bayocean, it also had an unexpected and disastrous effect on the spit. Severe erosion soon began devouring the beach at Bayocean, and in 1932 the natatorium was destroyed by huge waves. The last remnants of the once-popular resort were washed away in 1971. 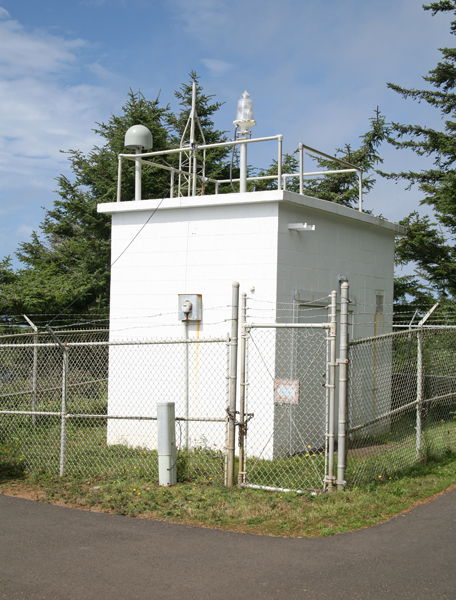 Electricity came to Cape Meares Lighthouse in 1934, and the two oil houses were dismantled. 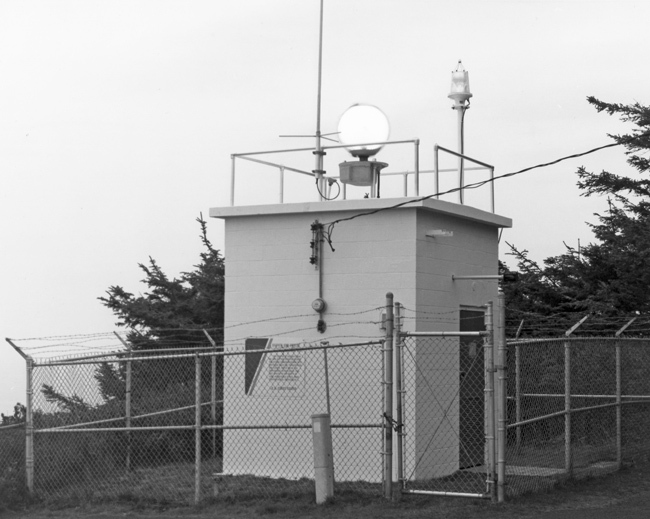 The lighthouse was decommissioned on April 1, 1963 when an automated beacon was installed on a concrete blockhouse a few feet from the tower. The new light had a characteristic of a white flash every fifteen seconds. After the new light was installed, the Coast Guard talked of removing the old tower. The workroom was torn down, and the tower started rusting away. Local citizens opposed the destruction of the tower, and in 1964, the property was leased to Tillamook County. 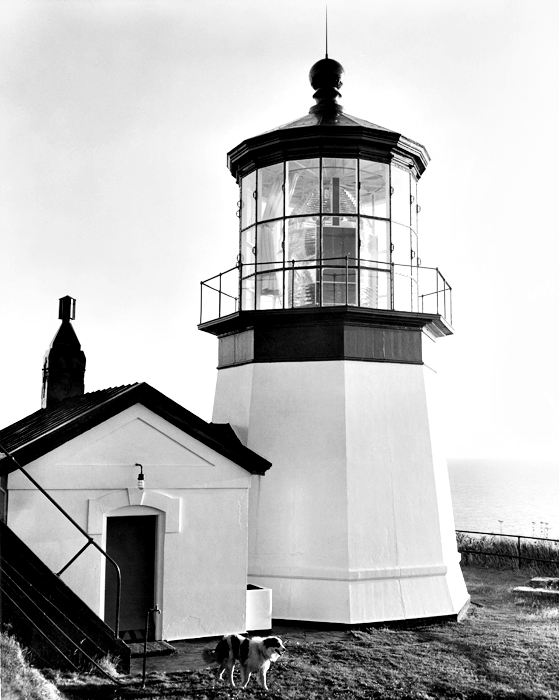 With no resident caretakers, the tower and vacant dwellings were subjected to vandalism, and the four bull’s-eye prisms were stolen from the Fresnel lens. In 1968, the property was leased to the Oregon Parks and Recreation Department, and the dilapidated keeper’s dwellings were razed. A replica of the workroom was rebuilt on the east side of the lighthouse in 1978, but it isn’t an exact replica as its door is located on the south side of the workroom rather than on the north to better accommodate visitors. The lighthouse was opened to the public on Memorial Day, 1980. 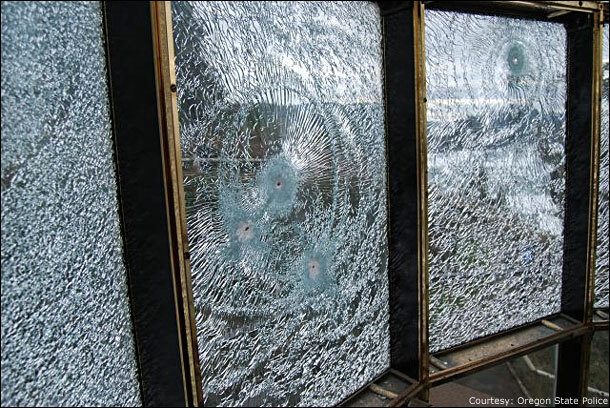 In 1984, one of the four bull’s-eyes from the Fresnel lens was recovered in a drug raid in Portland, Oregon. After a 1986 magazine article pleaded for the return of the others, the other three eventually found their way back. One was given to the Tillamook County Pioneer Museum, and another was anonymously left on the doorstep of a Cape Lookout assistant park ranger. 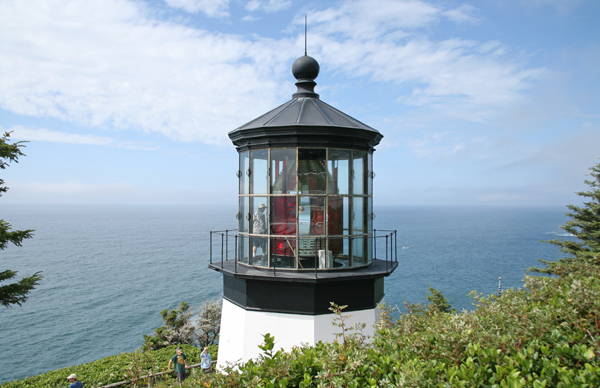 Today Cape Meares Lighthouse is part of Cape Meares State Scenic Viewpoint and is interpreted by Friends of Cape Meares Lighthouse. Head: Anthony W. Miller (1889 – 1891), George Hunt (1892 – 1903), Augusta Hunt (1903), Harry D. Mahler (1903 – 1907), George H. Higgins (1907 – 1909), William P. Ford (1909 – at least 1917), Mortimer Galvin (at least 1919 – at least 1921), Gust Jansen (at least 1924 – at least 1930), Charles Miller (1932 – at least 1936), Charles F. Walters (1940 – 1943), William R. Christensen (1943 – 1947), Archie G. Cameron (at least 1948 – at least 1952), Robert Gedlick (1955 – 1961), David A. Duncan (1962 – 1963). First Assistant: Andrew P.C. 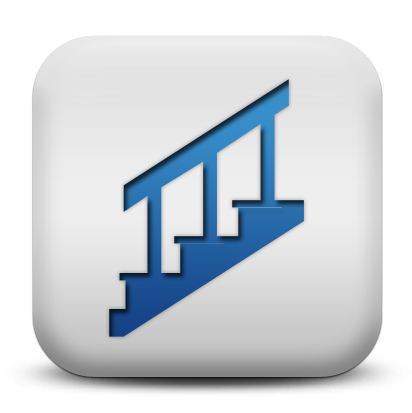 Hald (1889 – 1894), Daniel R. Hurlbut (1894 – 1900), Hermann Grossheim (1900 – 1902), Andrew Jackson (1902 – 1903), George H. Higgins (1903 – 1907), Gust Jansen (1907 – at least 1921), Charles Miller (at least 1924), Edmund N. Cadwell (at least 1930), Albert Beyer (1933), Eugene E. Mead (1939 – at least 1940). Second Assistant: Henry C. York (1889 – 1891), Daniel R. Hurlbut (1891 – 1894), Edward A. Brooks (1894 – 1898), George W. Boyington (1898 – 1900), George H. Higgins (1901 – 1903), Samuel B. Morris (1903 – 1906), Patrick Murphy (1906), Jacob Eriksen (1906 – 1910), John Matela (1910 – 1914), Charles Miller (at least 1915 – at least 1917), Henry Hill (at least 1919 – 1921), Merrill D. Spencer (1921 – 1926), John Petersen (at least 1930), Arthur Solverson (1931 – 1933), Albert H. Johnson (1933 – 1934), Arthur Solverson (1934 – 1937). Cape Meares and Its Sentinel, Clara M. Fairfield and M. Wayne Jensen, Jr., 2000. 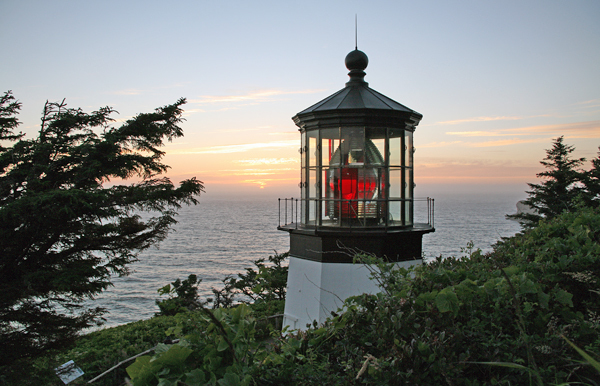 “After 124 years, Cape Meares light no longer shines,” Leeann Neal, Tillamook County Pioneer, July 1, 1014. 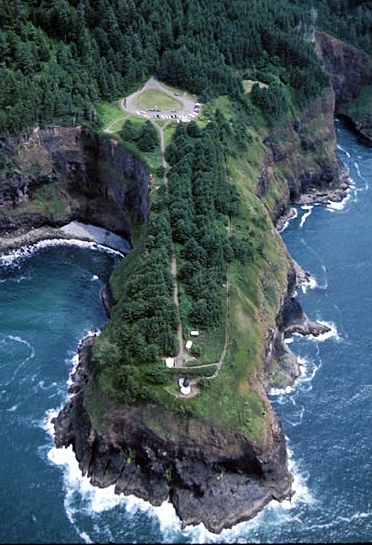 Located in Cape Meares State Scenic Viewpoint, roughly 10 miles northwest of Tillamook. Cape Meares is the northernmost of the three capes along the Three Capes Scenic Route, Cape Kiwanda and Cape Lookout being the other two. 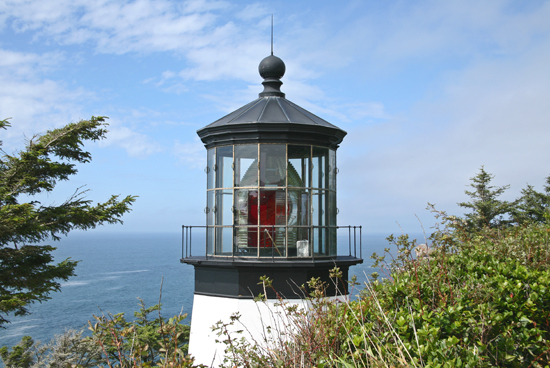 For a larger map of Cape Meares Lighthouse, click the lighthouse in the above map. From Highway 101 in Tillamook, take 3rd Street, also known as Netarts Highway, west to Bayocean Road. Proceed north on Bayocean Road around Tillamook Bay. The road will turn south and become Cape Meares Loop Road, part of the Three Capes Scenic Loop. Roughly 2.2 miles after the road turns south, follow the signs to Cape Meares State Scenic Viewpoint where the lighthouse is located. 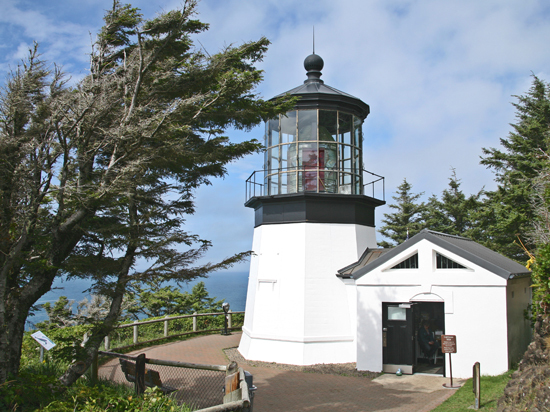 Cape Meares Lighthouse is open daily mid-April through early October from 11 a.m. to 4 p.m. by the Friends of Cape Meares Lighthouse & Wildlife Refuge, Inc.. A gift shop is housed in the workroom adjacent to the tower, which is open for climbing. 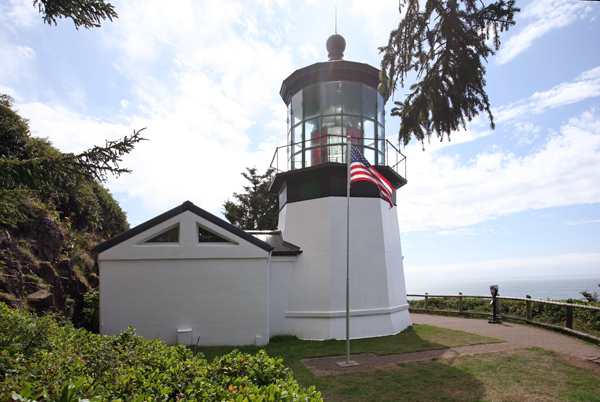 The lighthouse is owned by the Coast Guard and managed by Oregon State Parks. 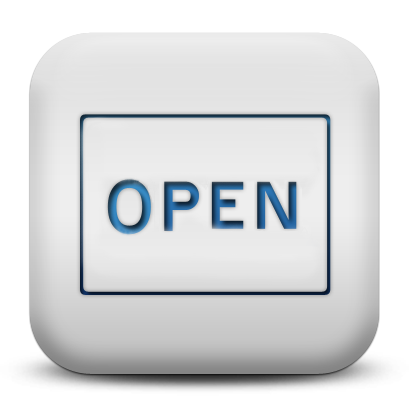 Grounds open, tower open in season. Just up the hill from the Cape Meares Lighthouse is the interesting Octopus Tree. 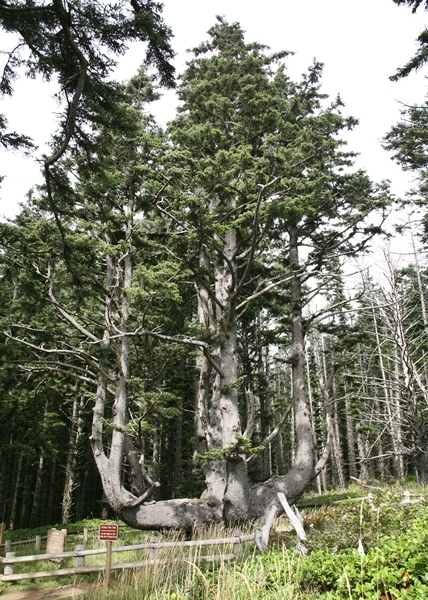 The many branches of this Sitka Spruce reach heavenward, resembling a gigantic candelabra. The tree merits the extra hike up the hill, especially if the tower is inaccessible as it was during our visit in the summer of 2003.